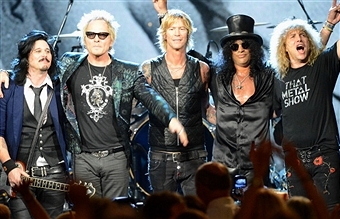 Former Guns N' Roses members Slash, Duff McKagan, Steven Adler,Matt Sorum and Gilby Clarke performed three "Appetite For Destruction"songs with Myles Kennedy at the band's Rock And Roll Hall Of Fame induction ceremony on April 14 in Cleveland, Ohio. Kennedy, who handles lead vocals in Slash's solo band and Alter Bridge, sang "Mr. Brownstone", "Sweet Child O' Mine" and "Paradise City", with "Use Your Illusion"-era member Sorum sitting behind the drum kit on"Brownstone" and the man he replaced in GN'R, Adler, pounding the skins for the other two songs. Fan-filmed video footage of the entire performance can be seen below.